I wash my hair every other day and that’s what I got in a week. After three washes, the water that ran down my hair wasn’t colored anymore. This hair dye is completely okay, I mean, nothing extraordinary, but not bad. The content of the box is typical except for a hair serum which is supposed to be applied before coloring. I like the soft tube with the hair dye, you don’t have to break your fingers squeezing it out. Also, the gloves aren’t huge. They aren’t thin either, and they don’t slide down my hands. I find the applicator bottle rather inconvenient because it’s impossible to control the amount of the hair dye left in it. The consistency was pretty runny, and I ended up covered with stains from head to toe, even though I don’t usually stain myself when coloring my hair. The dye was easy to remove from the skin. Once mixed, it became a little bit greenish. I felt uneasy about it but the green tint didn’t appear on my head. The dye didn’t make my head itch, like many other dyes do. My hair wasn’t straw-like (again, unlike after other dyes). I chose the color 3 to cover the repercussions of my previous experiments. The result was nice, despite the uneven base. Indoors, my hair looks almost black. Under the sun, it’s a nice dark brown color. Now I do my best to take care of my hair. Maybe it’s not trendy but I want it to be healthy. Hello gorgeous! I devote this review to those who try to get rid of dark roots or simply become a super natural and beautiful blonde. 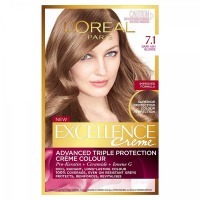 This is how I found a perfect hair color L'oreal Excellence Creme for my mom! Hi! I bet many of you have had a sudden desire to change something about yourself, and very often, it’s hair color. After many years of experiments I’ve come to the conclusion that warm colors with reddish undertone suit me best of all. Amazing hair color that applies really well. The shade: Jello. + BEFORE and AFTER shots. + Comparison with the Manic Panic hair dye. Is it possible to achieve a vibrant color on hair dyed with henna? My experience and before \ after photos. Siren's Song, Mermaid, Ultra Violet, Atomic Turquoise, Deep Purple Dream and how I mixed them.